Last month I was back from a very hectic set of trips to China and India. After the business leg of the trip I had a chance to extend it to a small vacation. Though the ‘vacation’ didn’t exactly turn out to be a pleasure trip, it has given me an opportunity to travel from the North to the South and to the East of India – by flight and also by trian. These travels have given me an opportunity to notice a few interesting things. Let me share one of them. India, I see has slowly but certainly taken to reading – in a big way I mean. And there are no two ways about it. And I see a set of factors that seem to be responsible for this trend. I mean, a set of facts have just about managed to hit the consumer sweetspot on reading. Let me explain this from a marketer’s point of view. His books are almost like catching up with your childhood buddy after say 5-7 years and sitting over a few drinks as you exchange your stories about love, life, work and dreams ever since you have met last. Price (INR 95): Everytime I come across a pirated books’ stall or vendor, I get to see all sorts of pirated editions. But there is one thing in common across all these cases – You would always find the ‘original’ edition of Chetan Bhagat’s books. This is because you can’t pirate his books with any more degree of sustainability. All his books are already priced at a comfortable low of Rs. 95, and it is as low as you can go down. In fact, if you shop online, chances are that you can get his books for an even lower price. Anyway the point here is that though Chetan Bhagat might not necessarily smile his way to the bank with the price point he has chosen with Rupa & Co, it is for sure a very well thought out price point. Place: By which I mean the distribution channels. Well you do have the typical channels like the books stores of different sizes and formats in metros, cities and big and small towns. But there is a particular channel of distribution that I want to focus on here – one that has lent itself to be a very relevant channel in this case. 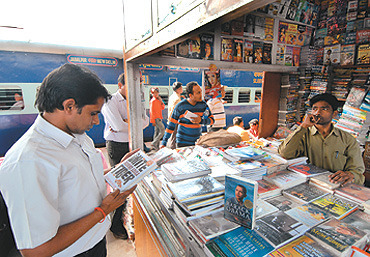 These are the small book stalls and vendors that you find throughout the length and breadth of India on its Railway Platforms. Let’s consider the case of a serious reader. She casts her own aspersions at the idea of buying a novel on the railway platforms. She knows that they are priced higher than even in the swankiest malls in her town/city. So unless she is very tempted to buy one she doesn’t usually feel comfortable to buy novels from the vendor on the platform. In most cases she might just settle for a magazine (as they are priced as the price tag on them says). But if she knows that there is some novel that is a quick read for her, doesn’t tax either her mind or her purse much she has no qualms to fish out that 100Rs note and get a Chetan Bhagat book along with the 5Rs change. Now let’s consider the case of a not so serious reader. She knows that she is not the ‘reader types’. Hence she doesn’t even consider a novel from the vendor at a railway platform. Novels for her are some ‘geeky stuff’ meant for those who have the right amount of patience and inclination. Nevertheless, she sometimes does crave for an ‘interesting’ time pass to while away her time on the train. So she prefers a very light reading material (even magazines can sometimes be seruios reading for her). Add to this the price, so unless she finds some book that is more conversational in tone, very Indian in theme (so that she can relate to it) with the right amount of masala and action and love and drama available at price that doesn’t make her feel guilty, she doesn’t even consider a novel at the vendor on the platform. So you got it the main elements of the mix working right for Chetan Bhagat books. And lo behold! When I get down the train to check out the collection of books at the vendors on the platforms, I came across atleast one customer quickly handing over a note of 100Rs and asking for one of his books – at almost every decent sized station. Seriously! And yes the vendor clearly stacks all the books of Chetan Bhagat (all 4 of them) in every case. And inevitably, as I walk down the aisle in the compartment, I catch quite a number of people engrosssed in a Chetan Bhagat book. Please note that this is not a one off scenario! My journeys took me across different states through various stations and this scenario repeated time and again and yes even on a domestic flight that I took from Delhi to Hyderabad! A passenger sitting right next to me was engrossed in 2 States. It was then that I realsied that something quite interesting has started to happen. More Indians are apparently taking to reading. It’s just that every elemenst of the mix has worked so well that they have hit bang on the consumer sweet spot! See for yourself. Travel and just keep your eyes open around you. You are bound to notice it. This silent ‘revolution’ could in fact overwhelm you (in a way) as it did me.